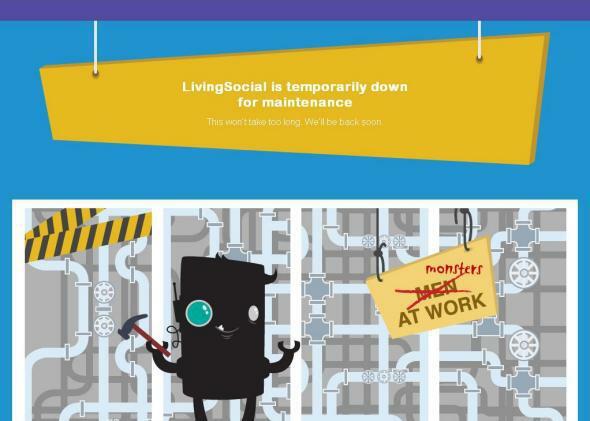 LivingSocial outage: Time to put daily deals site out of its misery. Won’t Someone Put LivingSocial Out of its Misery? LivingSocial has been “temporarily down” for 24 hours and counting. Once upon a happy time, LivingSocial was a thriving daily-deals startup, a challenger to Groupon in the red-hot daily-deals business and the great hope of the D.C. tech scene. Mayor Vincent Gray was a fan; an IPO was in the works. In any case, it’s hard to imagine a worse time for LivingSocial’s entire site to go down—and stay down for an incredible 24 hours and counting, despite a message on its home page claiming it’s just “temporarily down for maintenance” and that “this won’t take too long.” The outage is not the result of a malicious attack, the company assured AllThingsD’s Jason Del Rey. (Who would bother at this point, honestly?) I guess that leaves … what? Sheer incompetence? Hey, LivingSocial: You guys gave it your best shot. You had some good times there for a while. But maybe the next time you’re inches from bankruptcy, you should go ahead and pull the plug rather than sucking up another $110 million in life support. Come to think of it, why not do it right now? I’m sure many of your employees are very smart people, with far more worthwhile projects ahead of them. And I think the rest of the world has already learned to go on without you.